Boil grapes in 2 cups water over medium heat, use a heavy pot. When mixture boils, stir in sugar. In a bowl mix 1 cup water, shortening, salt and baking powder with flour. Dumplings may be formed with floured hands and dropped into the boiling juice mixture. Cover the mixture, let the dumplings boil for a few minutes, then set without heat for 5 – 10 minutes. Mix flour, baking powder, sugar, salt and shortening. Add juice and mix into stiff dough. Roll dough very thin on floured board and cut into strips ½” wide (or roll dough in hands and break off pea-sized bits). Drop into boiling grape juice and cook for 10 – 12 minutes. 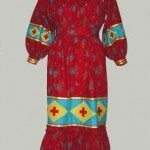 Some Cherokee cooks continue to make their grape dumplings by gathering and cooking wild grapes, or ‘possum grapes’ instead of grape juice. Cut chestnuts into small bits, then blend with whatever beans you prefer. Use whatever seasonings you wish, wild ramps, onions, (optional: a touch of sassafras), sweet grass or whatever. Cook the same as you would any other beans until done. 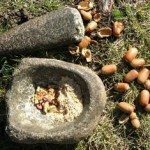 Begin by pulverizing the entire nut, shell and meat, continue to smash the nut until it can be worked into a paste, for a ball about the size of a baseball. This ball can be stored for long periods of time or kept frozen or very cold. To use, bring water to hard boil, put the kanuchi in a strainer, pour boiling water over the kanuchi slowly. Stir the kanuchi to break up the ball and make sure the shell part stays in the strainer. Makes about ½ gallon soup. Add cooked rice or hominy. Add sugar if desired. Kanuchi is considered to be a real delicacy. The nuts are gathered in the fall and allowed to dry for a few weeks before the kanuchi making begins. It is a simple process, but that does not necessarily mean that is easy. The hickory nuts are cracked and the largest pieces of shell removed either by shaking the pieces through a loosely woven basket, or picking them out by hand. Traditionally, a log was hollowed out on one end into a bowl like shape. The shelled hickory nuts are placed in the hollowed log and pounded with a long heavy stick with the end rounded to have the same contour, more or less, as the cavity in the log. The nuts are pounded until they are of a consistency that can be formed into a ball that will hold its shape. Kanuchi balls are usually about three inches in diameter and must be stored in a cold place. Today kanuchi is usually preserved by freezing. To prepare kanuchi for the table, place a kanuchi ball in a saucepan with about a quart of water and bring it to a boil to dissolve the ball. Allow the kanuchi to simmer about ten minutes and then poor it through a fine sieve. (A colander lined with cheese cloth works very well for this.) All the remaining shells are left in the sieve. If you have the time and patience you can pick the larger bits of nut meat from the shells in the sieve and add them to the liquid kanuchi. The kanuchi should be about as thick as light cream. Most traditional cooks will add about two cups of homemade hominy to a quart of kanuchi. Some cooks prefer hominy grits, which are prepared according to package directions and added to the kanuchi. Others add cooked rice. Such things as consistency and how much hominy or hominy grits to add are, of course a matter of taste, as is the addition of salt or sugar. 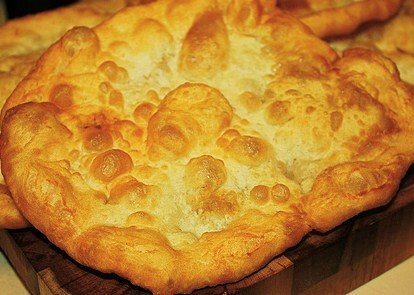 Although not uniquely Cherokee, Fry Bread is a standard with most Indians. 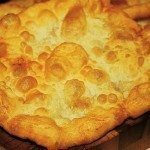 Different tribes make the bread in different ways and here is one recipe for a common Fry Bread in Cherokee communities. Mix Flour, baking powder, salt, powdered milk, and water. Heat shortening until flakes of flour start to bubble when dropped into oil. While shortening is heating, Pull off a palm sized mound of dough and roll it into a smooth ball then flatten into a disk shape. Size is a matter of preference. Put dough into pan, cook until brown, turn over and cook other side until brown. You can take a brown paper bag and place a few sheets of paper towels on the bottom and drop finished fry bread into bag to let grease drain. Makes about 6 servings. 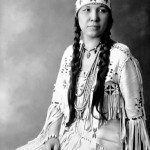 This is a modern recipe for a very old Cherokee food. 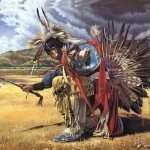 Gathering wild onions in spring is a ritual among the Oklahoma Cherokees, as well as the other tribes who live where these wonderful plants grow. Wild onions are often frozen and kept for months so they can be eaten the rest of the year. Begin with a cup of wild onions that have been cut into small pieces. Two or three tablespoons of bacon dripping are put in a skillet and warmed over medium heat. Place the chopped onions and about one fourth cup of water. Simmer while stirring until the onions are tender. You can add small amounts of water if needed, When the onions are tender, and most of the water has cooked away, add six or seven beaten eggs and scramble. Wild Onions have an important social aspect among many Indian people in eastern Oklahoma, including Cherokees. In the early spring, many Indian churches, stompgrounds, clubs and other groups hold wild onion dinners. Families and friends also often make an outing of gathering wild onions and/or eating them together. The wild onions are prepared by frying them with eggs and are usually served with other Indian dishes such as fry bread and grape dumplings. Wild onions grow in a variety of conditions but are best gathered where a loose moist soil promotes thick growth and easy digging. Timbered bottomlands are favored. Cattle grazing effectively eliminates the digging of wild onions. Wild onions are among the earliest greenery to emerge in the spring and cattle like to crop off young blaldes, making it impossible for humans to find them even if they survive the grazing. The milk of dairy cows grazing on wild onions takes on a strong flavor that most people find objectionable. We’d like to thank Bonus Promo Code.com for sponsoring this page. BPC reviews popular promotional codes that visitors can redeem to get extra welcome bonuses or special perks from the top online gaming sites. You can read about their Bovada Casino bonus code here. The Bovada Casino is licensed by the Kahnawake Gaming Commission, based in the Mohawk Territory of Kahnawake in Canada.